Technology can be highly fascinating and engaging, but as with anything earthly that has a powerful influence and presence in our lives, it needs to be handled with both wisdom and moderation. At Trinity Christian School, we practice this perspective, so we teach technology to our students not as a "shiny new toy", but rather in concert with our curriculum. This is how the classical education model meets the modern world. When technology evolves, we evolve with it, but we do not change the focus and content of our curriculum as a result. 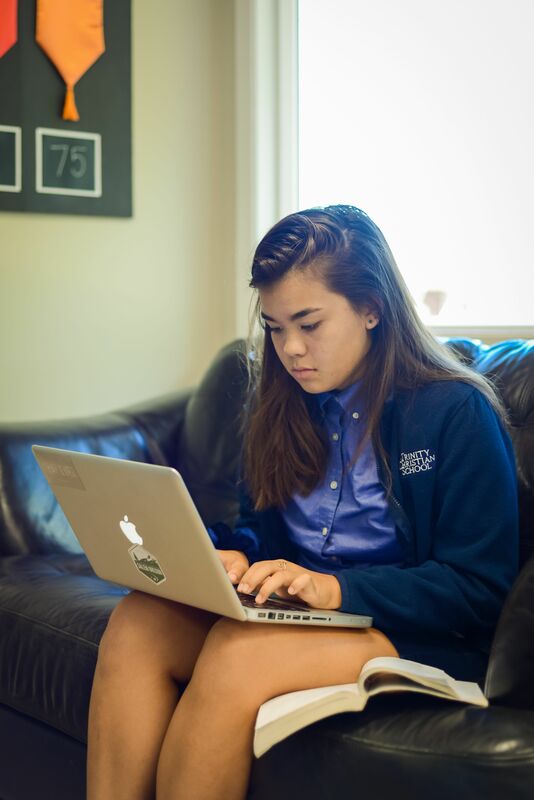 Our classical use of technology can be seen in our writing and composition classes in how our students will learn to write on paper in the earlier grades, then in the upper grades they will learn to formally write on a computer, but the emphasis is always on the actual writing. In our science classes, students learn to calculate their data and write their lab narratives on the computer, but the emphasis is on the proper scientific process. Students learn to make a presentation to their class using the computer, but the emphasis is on the organization and methodology of making a presentation. Technology itself should never be the focus of our lives. It is, however, woven into almost every aspect of how we live today. We need to understand it so that we can live our lives how we choose, with wisdom, clarity, and moderation.